Sybil Runs Things: Further signs of success! I made another gluten-free, vegan muffin recipe from Tom and Ali's cookbook "Whole Life Nutrition". This time I seriously adapted the Quinoa Banana and Apple muffins. I didn't have quinoa flour, so I used rice flour, instead. I didn't have raisins, either. I used canola oil instead of coconut oil. Truth be told, I felt like I was taking a few too many liberties with this recipe considering my rudimentary knowledge of GF baking. But you know what? They turned out great. I baked 3 1/2 batches of mini muffins. After the first two batches I realized that I needed to turn the oven down from the 375 the recipe recommended and baked them at 350 for about 26 minutes. They were perfect! 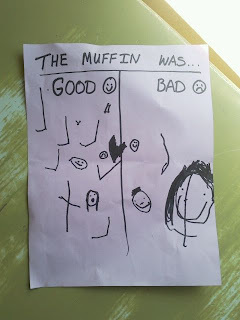 Her teacher told me that some of the kids even drew the smiles in the "bad" column, further driving home the point that they were well-received. Whew! I am so thrilled that I've found a couple really solid recipes. Both from the same cookbook! I am going to re-try the ones from Gluten-free Goddess, though. This time with real egg replacer. There are some pumpkin ones I've been thinking about, as well. When I just saw the picture, I thought maybe the smiles in the "bad" column were supposed to be softening the blow. Ha ha! I'm really impressed with your experimenting. All hail, Queen of GF Muffins!